27 North Earl Street, Dublin 1, Ireland. If you are coming from the south side of Dublin city, we are 10 mins from Merrion Square by car. Drive towards Pearse Street, turning left towards Tara Street, cross over at Tara bridge keeping to the left lane after crossing so as to turn up by Gardiner Street Lower. Take the 3rd left turn down Sean MacDermott Street Upper continuing on to Cathal Brugha Street. The Q Park is on your left before the junction of Cathal Brugha Street and Marlborough Street. We are then located just 2mins walk from the car park (red circle). See below map for guidance. If you are coming from the north side of the city, we are located 8mins from Fairview by car. Drive towards the city centre through North Strand and onto Amiens Street. Take a right turn at the corner of Amiens Street and Foley Street onto Buckingham Street Lower. Turn left onto Sean MacDermott Street Lower and continue on straight to Cathal Brugha Street. The Q Park is on your left before the junction of Cathal Brugha Street and Marlborough Street. We are then located just 2mins walk from the car park (three doors from the Spire). See below map for guidance. 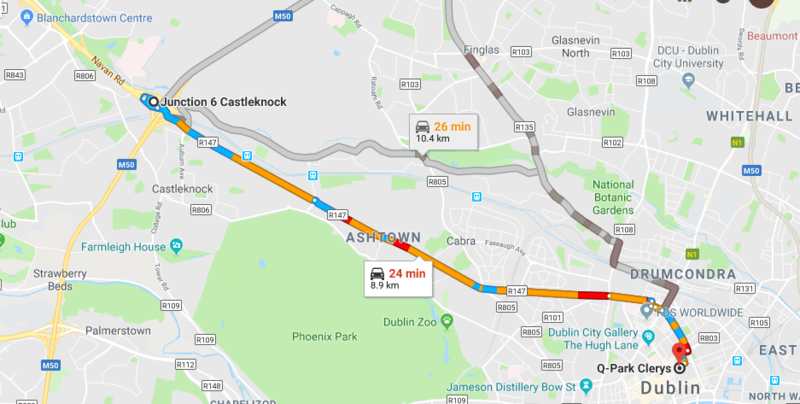 If you are coming from the west side of the city, we are located 24mins from M50 Junction at Castleknock by car. 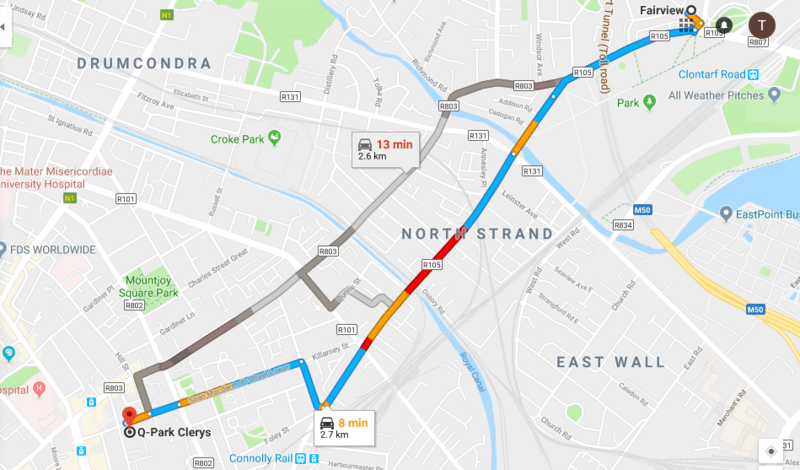 Drive towards the city centre via the Navan Road and continue onto the R147. Continue onto North Circular Road, turning right onto Leo Street, and then left onto St. Joseph Street. Continue onto Synnott Place and then onto Gardiner Street Upper. Turn right onto Parnell Street. Turn left onto Cumberland Street North and right onto Cathal Brugha Street. 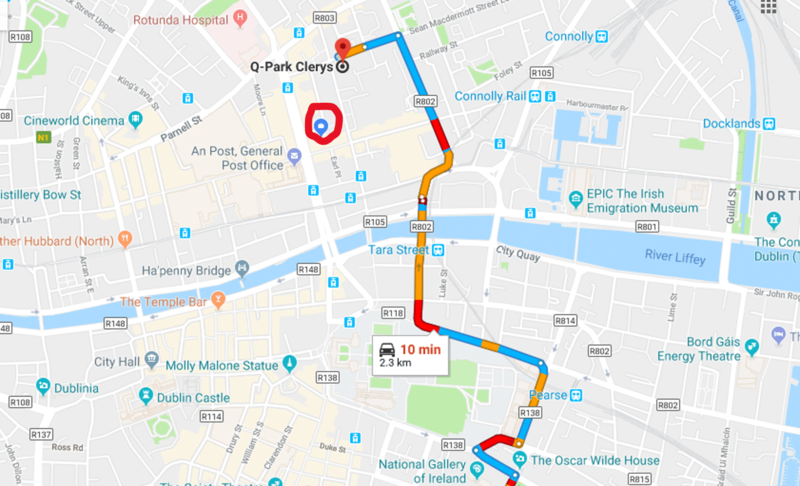 The Q Park is on your left before the junction of Cathal Brugha Street and Marlborough Street. We are then located just 2mins walk from the car park (three doors from the Spire). See below map for guidance. Parking available in the Q-Park on Marlborough Street, Dublin 1, which is open 24/7 Monday – Sunday. We’re open 7 days a week, see opening times above.